Have you ever had back pain so bad you couldn't get up? Couldn't move at all? Spasms that racked your whole body with pain? This has happened to me exactly once in my whole life, after which I never again have taken lightly the aches and pains of another back-pain sufferer. And so, since some of my family members have had this kind of pain more than once and in fact are still suffering from back pain almost constantly, I was glad to find this book, which I rushed through in a single day so that I can send it on to one such family member. It is full of information you're never going to hear from your primary care physician, orthopedic surgeon, chiropractor, personal trainer, or physical therapist. And the author , Cathryn Jakobson Ramin, obtained this information the hard way, by suffering excruciating back pain for years and going through all those recommendations from all those people mentioned in the previous paragraph, without finding relief until she disregarded their advice and found her own way....and at the same time realized that there is an actual "back pain industry" that relies on keeping patients immobile, compliant, and passive. ---Why "chiropractic" might fail you: Chiropractic was founded by a quack, and even though many modern chiropractors don't believe in the pseudo-medicine preached by its original practitioners, their procedures don't actually help with many of the aches and pains they claim to heal. In fact, there is a statistical correlation between a certain chiropractic neck "adjustment" and stroke. ---Why you don't want, or need, an MRI: Results shown on MRI images may convince you that you have a condition far worse than you thought, which may actually increase your pain and suffering (and, as we all know, there is a difference between pain and suffering). In fact, as one article from a reliable source states, "When it comes to diagnosing most back pain, MRI machines are like Monty Python’s medical machinery that goes “bing.” For back pain, MRI and X-ray are medical machines that make false alarms." ---How epidural spinal steroid injections can go wrong, and why lumbar spinal fusion is almost never the solution to back pain. ---Why other back-pain-specialist treatments are often contraindicated, except by the specialist who stands to make money from them. ---The truth about NSAIDs (non-steroidal anti-inflammatory drugs) like Ibuprofen --- which BTW is why I'm going back to pure aspirin. ---What you can really do to get lifelong relief from back pain, as experienced by the author. There's more, lots more. 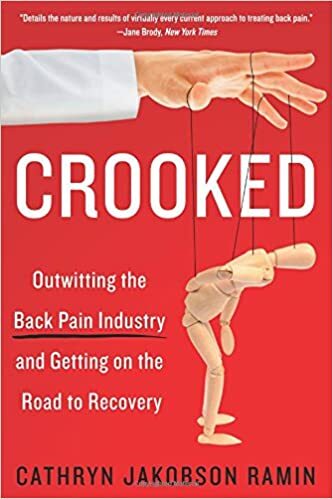 So, instead of researching online articles to cite here, because, you know, life is short, and I have to get ready to go to church, I recommend reading the book carefully on your own to find out what might help the individual back-pain sufferer. One thing I like about the book is the way personal experience, the author's personal search for relief, is incorporated into the reading. She is an investigative journalist; she knows how to find original sources and analyze every possible kind of claim and counter-argument; yet her own experience is almost her best credential in this subject. Another great feature of the book is a set of notes for each chapter, with source materials and additional information; and the link to the author's own website for more.